Migrant v Refugee. It Pays to Increase Your Word Power. Person who moves from one country to another to find work or better living conditions. A migrant can return home whenever they want. If they decide to stay in their new country forever they become an immigrant. A person who is outside their home country because they have suffered, or fear, persecution on account of race, religion, nationality, or political opinion; because they are a member of a persecuted social category of persons; or because they are fleeing a war or famine. 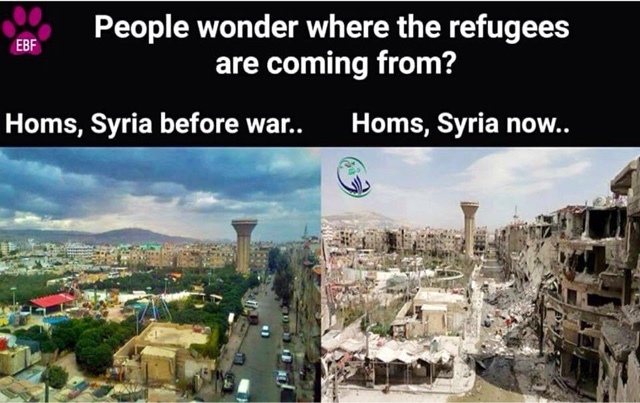 There is no home country to return to. Until the country they've fled too accepts them, they are an asylum seeker. The photo is "The Refugee" by Diana Brandenburger. 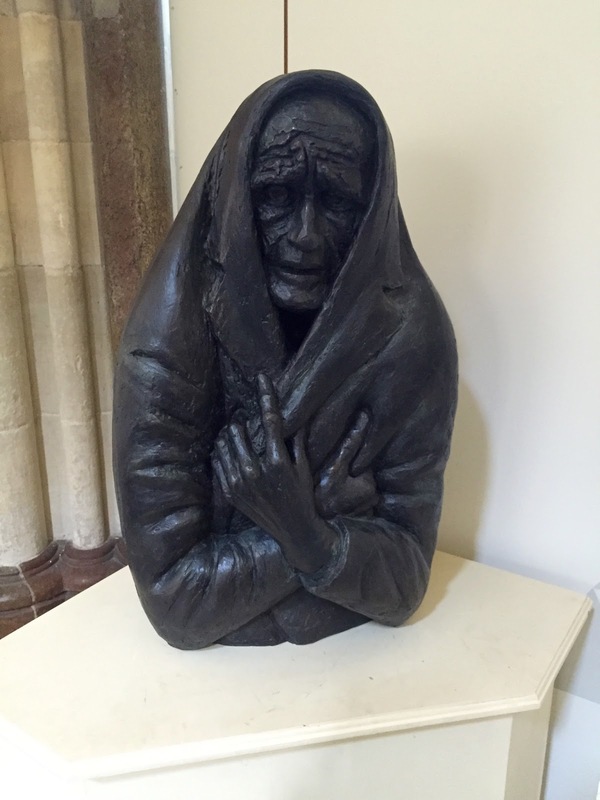 It can be seen at Chichester Cathedral. If the Syria now was the view from my window, I'd do anything, go anywhere, risk everything to keep my family, my child safe. In the hope of giving them a better life. Because I just would. Hoping that when I got wherever it was, I'd be welcomed by people who understood that I'd come with nothing apart what I was wearing, the few things that I could carry and my family. Looking for a new home in a safe place, opportunities to work and learn. Want to help? The Independent has details of five practical ways you can. We're all people and we all want the same things for our families. My friend Mandy shared this on FB. It's on a bus stop in Liverpool. Thank you Mandy, hope you think I've put it to good use. I know this is complicated, but if a society is judged on how it looks after the poor and the powerless, we're not doing that great ... Want to change that? There is nothing more heartbreaking than people who die trying to escape their homeland that is filled with war, angry and death. It's easy for me to turn away from such harsh topics but that's the problem... people have been turning away for far to long. May peace and safety be yours. So well said. The misuse of the terms really annoys me. I personally do not object to economic migrants at all, they are very important to our economy, and a lot of false information is spread about them. However, this issue is much more important than trying to change people's minds about economic migrants, so what is vital is that people know that these are not migrants. Nobody should be allowed to get away with insinuating that these are people taking a leisurely stroll to try to cash in on the wealth of our nation, when they are actually fleeing for their lives and dying in their thousands. Moreover, these deluded egotists who are convinced that ALL of these people are specifically trying to reach the UK (because we're so great), need to look at the statistics, get a grip and realise that they are trying to get ANYWHERE. Anywhere at all where they might be safe. That piece of graffiti is the best I have seen in a long time - well done that person! I agree, if I was faced with what these refugees are, I would do anything and go anywhere to try to keep my children alive. & I would not risk them in treacherous journeys unless what was at home was worse. & if my children were ever in that sort of danger I would hope that there were people in the world who would do everything they could to help them. There seems to be two ways to help - raising awareness of the issues and changing the conversation and doing practical things like offering a room. Some are in a position to do both, whilst others can only offer their voice. Frankly, let's take what we can get! To quote a slogan from a supermarket started by a migrant from Poland, "Every little helps". If your post is the one I think it is, I loved it! It was absolutely beautiful. Thanks for writing this. It makes me angry every time the BBC refers to this as a migrant crisis rather than a refugee crisis - though I have noticed today that they started to use the terms interchangeably which is a step in the right direction I guess! 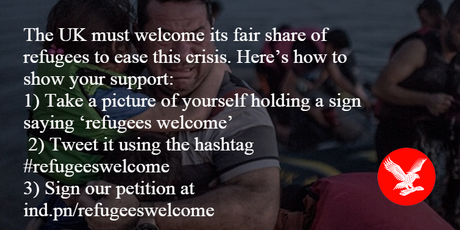 I hope that if enough people speak up then the media's poor coverage of the real issues and people's disgusting attitudes towards refugees will start to change. My heart breaks for humanity right now. #PoCoLo. Mine too. The vein in my neck isn't doing to well either as the news coverage just annoys me as it's designed to reinforce prejudices rather than challenging them. Thank you, the street art is amazing. Well done that person! All of this saddens me and to see the children just breaks every piece of my heart...especially being a mother. Thank you for sharing with #momsterslink.